Now that is a load off my mind! They have finally begun adding repair and cartographic services at Explorer's Anchorage, near Sag-A. While proximity to the scanned systems blocked me from cashing in everything, I was able to unload most of my data and buff my bank account by over 50 million credits. I probably have another 10 million credits worth of data that will have to wait until I get back to Colonia. I didn't sign up for or even travel with the Distant Worlds 2 fleet, and my plan was simply to arrive at Sag-A ahead of a couple of my fellow Silverbacks so I could wing up with them as part of the construction initiatives. I still haven't decided if I want to follow the fleet to Beagle Point, even though I haven't been there before and that's on my bucket list. I may take us straight down from the galactic plane and then plot a course back to Colonia Dream, scanning what will likely be much less traveled systems. Might even make a few new discoveries on the way. We'll see. 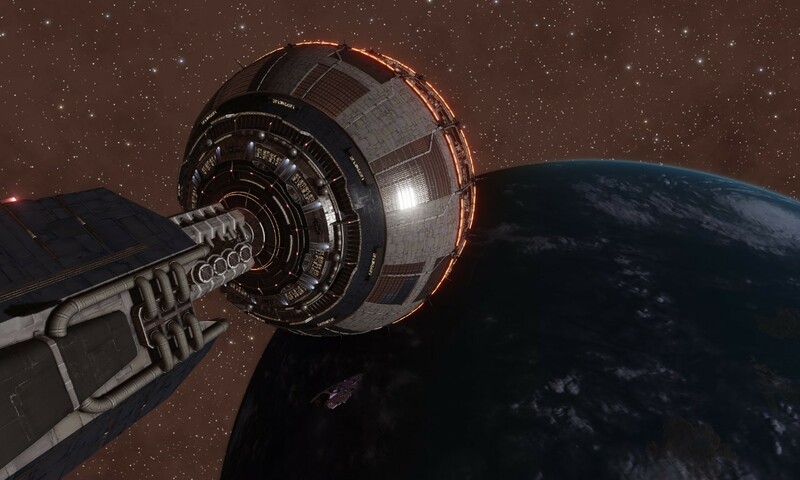 The bulk of the DW2 fleet hasn't arrived yet, and I know they plan on being here for at least a couple of weeks to finish the station. I'm still burning from the loss of three of our Silverbacks over...well, childishness. As commanders, most of us realize The Black is a very unforgiving, unyielding thing, and we don't have a lot of time to forge friendships and alliances to get through all this and, well, generally make a life as opposed to just existing. I've developed a pretty thick hide over the years, and I'm surprised when other folk aren't able to just blow off the ridiculousness of others. By the same token, I've learned that I have my world view, other people have theirs, and often those won't mesh well. I've figured out that there is a line you can walk between freely expressing yourself and censoring yourself to keep the peace. You don't have to get all "apologetically" when you accidently identify a trigger for someone else, but you can realize you've got one foot in a mine field and careful walk around it. Compartmentalization is important. But, sheesh, it's 3305...you'd think we've figured out how to be ladies and gentlemen, even if we are rogues and rapscallions. Anyway, with repair services here at the station now, I won't need to offer up repair limpets to incoming commanders unless they happen to be in real dire straights and unsure about making it back to Explorer's Anchorage. I can concentrate on doing some more exploring. If I run across any really great mining spots for the fleet I can start bookmarking those. Francisca found out a friend of hers...you know, a "friend"...has arrived at the station, so she's trotted off to exchange benefits. She got a pretty health bit of coin from her cut from the cartographic data I sold, so she's feeling pretty good about herself. And, since I can't sell off any more while I'm here, I told her that I'll go do some more exploring while she catches up at the station. She'll wave me if anything interesting happens. For now, I'm gonna hit the sack. It's been a day. 100 Jumps Until Beagle Point! 97 Jumps to Waypoint 11...DAMN, so close! FINALLY departed Explorer's Anchorage...and then What The Actual? She Left Me! She's Frickin' Left Me!